Two laid-off workers are suing the Ontario Ministry of Labour for giving them inaccurate advice about their entitlements. Michael Mosey, 50, and Eileen Tremblay, 59, were employees of Trillium Screw, a manufacturing company in Pickering, Ont. Mosey was a product manager for 22 years and Tremblay an office manager for 13 years. In June 2012, Trillium Screw had to lay off many employees, including Mosey and Tremblay. The company offered eight weeks of pay and benefits. Both workers consulted the Ontario Ministry of Labour’s helpline, which informed them they were entitled to eight weeks of pay and benefits under the province’s employment standards legislation because less than 50 employees were being laid off. However, they were not given any indication this was the legal minimum and they could be entitled to much more notice or pay in lieu of notice if they challenged the terminations in court. They agreed to the severance amounts offered and signed releases freeing Trillium Screw from further claims. The company is now out of business. 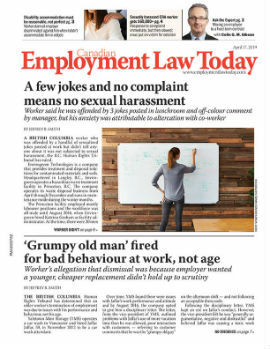 Common law cases generally result in notice awards that consider factors such length of service, importance of the employee’s position, the employee’s age, and the likelihood the employee can find similar employment within a reasonable amount of time. These awards usually result in larger amounts than the employment standards minimums. Mosey and Tremblay filed suits in the Ontario Superior Court of Justice, claiming they should be entitled to 24 and 16 months’ notice respectively, based on other common law cases and the ministry helpline should have clued them in on their entitlements. The Ministry of Labour indicated it intended to defend itself in the lawsuits.